Jiang Qi is an internationally renowned dance artist. He received his early ballet training at the Beijing Dance Academy, and he later received his BFA and MFA from the University of Utah Department of Ballet. 1978—joined the National Ballet of China and as a member of the first Chinese Arts Troup was invited to visit the U.S. to perform in the Chinese ballet Red Detachment of Women at Lincoln Center. 1979—joined the National Song and Dance Theater as a leading dancer. 1984—featured in the music and dance movie The Song of Chinese Revolution; awarded the honor of Premier Artist of China by China’s Ministry of Culture. 1985—danced and studied with the Joffrey Ballet Concert Group in New York and served as an apprentice with Twyla Tharp Dancers. 1986—joined Ballet West as a soloist under the direction of John Hart. 1988—promoted to principal dancer of Ballet West, danced lead roles in ballets such as La Bayadere, Coppelia, Romeo and Juliet, The Dream, The Nutcracker, Cinderella and Giselle as well as in the works by George Balanchine, Frederick Ashton, Antony Tudor, Val Caniparoli and many others. 2000—appointed to ballet master of Ballet West by Artistic Director Jonas Kage. 2002—served as a panalist for the National Endowment for the Arts. 2005—promoted to associate professor with tenure; became the artistic director of Dance China New York; received an award for Artistic Excellence in Choreography Project from The National Endowment For The Arts 2006-10. 2008—awarded third place in choreography in China’s Lotus Cup Dance Competition. 2010—featured on China's National TV's documentary film Dancing in America. 2012—appointed to chair of CCM's Dance Department; appeared as a master teacher for the IV Beijing Ballet Invitational; published article in the Journal of Beijing Dance Academy; received the Distinguished Alumni Award from the University of Utah; served as jury and master teacher for the VIII Brazil International Dance Festival. 2013—invited as a VIP guest to the 2nd Beijing IBC. 2014—invited to present a group of CCM dancers to perform for the IV Beijing Ballet Invitational; published article in the Journal of Beijing Dance Academy. 2015—served as jury for the Taiwan Ballet Grand Prix; served as Master Teacher for the 3rd Beijing IBC. 2016—served as Ballet Master for the V Shanghai IBC. 2017—Featured in China's Dance Magazine in August; served as VIP guest for IV Beijing IBC; served as Jury for Taiwan Ballet Grand Prix; published articles in China's Ballet Magazine and Journal of Contemporary Research in Dance. 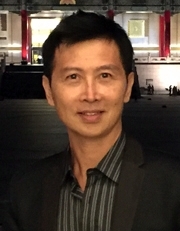 Professor Jiang Qi's choreographing and staging with CCM Dance includes full length productions of Swan Lake and Giselle, as well as original works. As a guest artist, Jiang was a guest principal dancer with Hong Kong Ballet, Tulsa Ballet and Toshiko Sato Ballet of Japan. He was a guest master teacher for Pacific Northwest Ballet, Cincinnati Ballet, Louisville Ballet, BalletMet, Singapore Dance Theater, Tianjin Ballet of China, Shanghai Ballet of China, Guangzhou Ballet of China, Suzhou Ballet of China, and Joffrey Ballet School. He was a guest choreographer for Beijing Dance Academy, Shanghai Theater Academy, Utah Ballet, Utah Regional Ballet, Joffrey Ballet School, Shandong University of China and Taipei National University. BFA and MFA, University of Utah , Salt Lake City, UT.